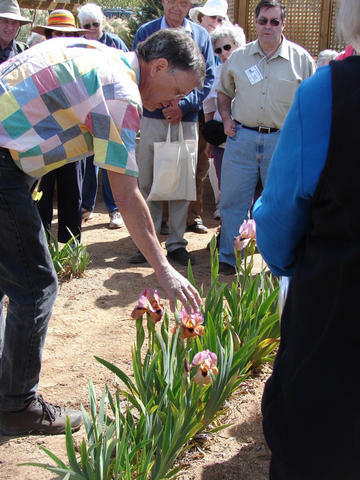 Want to tour a garden featuring aril or arilbred irises? Or are you looking for where to buy some of your own? Then you've come to the right place. The following Display Gardens feature arils & arilbreds and are open to the general public at certain times of the year. An appointment may be necessary so please contact them in advance of your visit. We have also compiled a list of commercial sources for arils and arilbred irises. Nurseries marked with an asterisk * indicate that they are specialists in arils and arilbreds. Photo of Lowell Baumunk with 'Refiners Fire' by Cindy Rivera. Aril Society International (members-only plant sale) ASI members receive plant sale booklet in early June. ASI members receive seed sale list in September. SIGNA members receive seed list in late December or early January.